One of my favourite Dwarves has finally gotten his barrel rider statue. 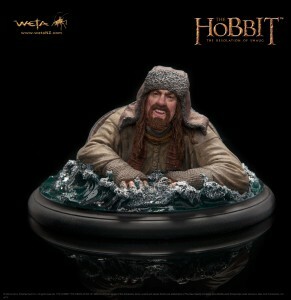 Bofur the Dwarf, who was such a great character during the films, joins Bilbo, Oin, and Bombur as the fourth barrel rider. This fantastic little piece is sculpted by Gary Hunt who you will get to know better through several reviews that are coming up. Bofur comes in with a price tag of only $65 and is in-stock shipping from the New Zealand warehouse.